The daughter of a Venetian musician, Aemilia Bassano came of age in Queen Elizabeth's royal court. The Queen's favorite, she developed a love of poetry and learning, maturing into a young woman known not only for her beauty but also her sharp mind and quick tongue. When Aemilia becomes the mistress of Lord Hunsdon, she fears her mind will languish—until she crosses paths with an impetuous playwright named William Shakespeare and begins an impassioned but ill-fated affair. As Sally O'Reilly charts the course of Aemilia and Will's tempestuous relationship, she paints a vivid and richly imagined portrait of Elizabethan London—haunted by plague and steeped in magic—and breathes life into England's first female poet, a mysterious woman nearly forgotten by history. Full of passion and devilish schemes, Dark Aemilia is a tale worthy of the Bard. Sally O'Reilly has received numerous citations for her fiction, which has been shortlisted for the Ian St James Short Story Prize and the Cosmopolitan Short Story Award. A former Cosmopolitan New Journalist of the Year, her work has appeared in The Guardian, The Sunday Times, the Evening Standard, and the New Scientist. She teaches creative writing at the Open University and the University of Portsmouth in England. 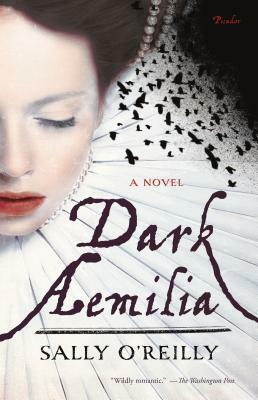 Dark Aemilia is her U.S. debut.